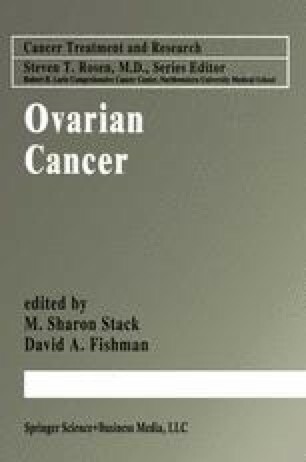 Ovarian carcinoma continues to be the most common cause of death from gynecologic malignancy in the United States. This high fatality rate can be attributed to a lack of early, effective screening strategies and lack of specific symptoms associated with early stage disease. Thus, approximately 70% of women with ovarian cancer present with advanced stage disease. Although advances in surgical therapy and chemotherapy have improved progression free survival, the long-term 5-year survival rate rarely exceeds 30% for patients diagnosed with this disease (1).